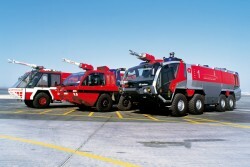 Rosenbauer, the fire-equipment industry's leading manufacturer, has won an order from the Saudi Arabian Ministry of the Interior to supply fire engineering equipment worth a total of € 245.3m. 1,125 vehicles are to be supplied, of various types and for various operational purposes, as are boats and other civil defence equipment. Due to the rapid increase in the Kingdom's population over the past few decades, it has been decided to launch an additional expansion program for the fire protection sector. This will involve building and fitting out 180 new fire-stations, mainly in urban areas. As well as this, some 6,000 extra firemen have been recruited and are currently undergoing training. Besides water tankers built to European Standards, the supply contract also comprises pumpers and rescue vehicles manufactured to US Standards. In addition, heavy recovery vehicles, aerial ladders, boats and hydraulic rescue equipment have been ordered. Most of the vehicles are to be produced at the Rosenbauer plants in Leonding, Lyons (SD), Karlsruhe and Spain. Non-Rosenbauer-specific items such as boats are to be subcontracted to specialist vendors. The order as a whole is be fulfilled in several part-deliveries spread across the next 30 months, i.e. through until mid-2014. "This success underlines the Rosenbauer Group's industry-leading position yet again. Thanks to the highly satisfactory order trend over the past few months – and in contrast to the negative developments in the market as a whole – capacity utilization at our production facilities is assured for the next two years", comments the Rosenbauer Group's Executive Board Chairman Dr. Dieter Siegel. Rosenbauer's long-standing working relationship with the Saudi Arabian clients is founded upon the high quality of its products, which have been developed in close collaboration with the customer to meet local requirements.